3D printing is a manufacturing method dating from the ‘80s. Chuck Hull, co-founder of 3D Systems, created the first 3D printer in 1984. Despite promising discoveries, the additive manufacturing remained discrete until the 2000’s, the expiration date of the patents protecting its use. Foreseeing that 3D printing will disrupt numerous sectors of activity, some say that 3D printing revolution is more important than that of the Internet. 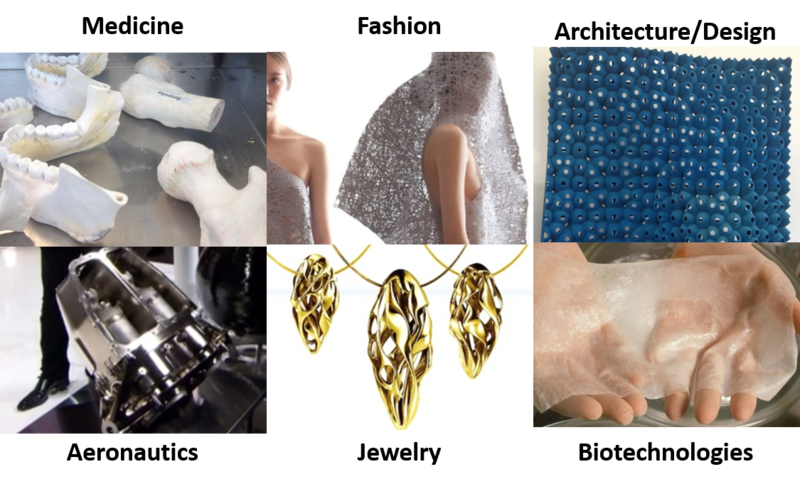 The technologies developed in the scope of 3D printing are numerous. Today it is possible to work with 110 different materials ranging from titanium to ceramics, from sugar to living cells. The printers are also improving. They can print simultaneously with several materials and print sizeable pieces. Architectburo DUS and Utilimaker have thus developed together a printer capable of printing pieces 2 meters wide and 3 meters high. However there remains pitfalls upon which the firms are focusing. In particular, the triptych cost/quality/speed could be improved. For the moment, printing pieces remains a long process, which does not allow the operation to scale up into mass production. In addition, for the machine to print, it needs digital files. But the software is complex and thus not many people know how to create these 3D design files. Businesses like Autodesk are looking to simplify the user interface. The technological advances as well as the innovations are numerous and should multiply in the coming years. This progress foreshadows a price reduction of 3D printers (prices that extend at the moment from $250 to over $1,000,000). The market for 3D printers is new and thus unstructured. Important groups like Autodesk are rubbing shoulders with startups like Sculpteo or Type A Machines. These categories are not exclusive and players like 3D Systems are 3D software editors, machine builders, and services providers. The ‘pure’ services providers are, for now, rare. Sculpteo estimates thus having only 3 direct competitors. As long as the market grows and increases, the players will obviously multiply. Hence, distributors like Amazon or Wal-Mart show some interest in 3D printing. HP has also declared last March that they wish to make 3D printing one of its big development axes this Summer. As far as education is concerned, schools are a non-negligible method of entry in order to democratize the use of 3D printing, to educate students’ use of this new technology and also to create new jobs. Thus, at UC Berkeley, the environmental design college sees a growing use of 3D printers. Additive manufacturing opens a number of doors that globalization and mass production had condemned. It allows for agile and flexible production via production of small series’ and via reducing inventory. It reduces delays because it eliminates many supply chain links. This flexibility is key in order to make the SMBs competitive against corporations. It also establishes itself in the sustainable economy. Additive manufacturing limits the consumption of materials. In addition, more and more materials are developed from trash and are themselves recyclable. Ideally, the construction and the consumption of finished goods produced thanks to 3D printing will attain the local level, thus limiting transport costs. The applications of 3D printing will grow when progress is made, but some sectors are already benefiting from it. This is the case of the medical sector and, in particular, prosthetics. 3D printing allows the production of prosthetics to be customized to all at a small cost. The Defense and Aeronautic departments are domains in which 3D printing applications are used in a more surprising fashion. Elon Musk, the founder of Space X, recently explained that for the production of certain pieces of his new space shuttle, he resorted to 3D printing because the complexity of the pieces was too much to be built in the traditional manner without compromising their durability. Some still believe that 3D printing is not a major technological advance and that it will be quickly put in the gadget category. However, there is promise of a new industrialization via 3D printers, that’s why this technology cannot be ignored. 3D printing is now becoming a manufacturing tool, with unique properties in terms of customization and adaptation to industrial and commercial needs. 3D printing has a real opportunity to completely disrupt the manufacturing industry. Forester estimates that eventually one-third of the global manufacturing industry will be taken over by 3D printers.